Can you do “real” marketing on Instagram? That was the question bestselling author Jason Miles wanted to answer. So he used his e-commerce company as a laboratory and he began to study what other successful marketers were doing. While some marketers haven’t even heard of Instagram there is a growing group of smart marketers using highly successful Instagram monetization strategies to grow revenue. 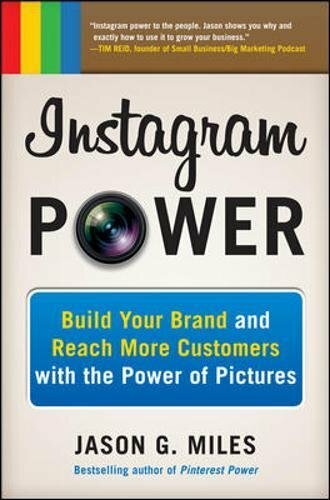 If you’re not using Instagram to your advantage, this book will help you start now. Instagram is the hottest social media site today: Two years after its launch, the number of its daily mobile users surpassed that of Twitter. Then Facebook purchased it for a billion dollars–and it took the world by storm. In Instagram Power Miles provides everything you need to start marketing on the world’s most popular photo-sharing App. You’ll get it all in a quick and easy to read format. Miles will take you from setting up an account, to implementing the ten proven monetization strategies, to integrating Instagram with your complete marketing strategy. Whether you’re a kitchen table entrepreneur, or a corporate marketer, this book will become one of your most trusted resources.